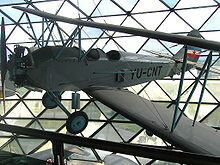 The Polikarpov U-2 or Po-2 served as a general-purpose Soviet biplane, nicknamed Kukuruznik (Russian: Кукурузник, from Russian "kukuruza" (кукуруза) for maize; thus, 'maize duster' or 'crop duster'), NATO reporting name of "Mule". The reliable, uncomplicated and forgiving aircraft served as a trainer and crop-duster in peacetime as well as a low-cost ground attack, aerial reconnaissance, psychological warfare and liaison aircraft during war, proving to be one of the most versatile light combat types to be built in USSR. It is the second most produced aircraft, and the most produced biplane, in the history of aviation. More than 40,000 Po-2s were built between 1928 and 1953. It remained in production for a longer period of time than any other Soviet-era aircraft. The aircraft was designed by Nikolai Polikarpov to replace the U-1 trainer (Avro 504). Its name was changed to Po-2 in 1944, after Polikarpov's death, according to the new Soviet naming system using designer's initials. The prototype of the U-2, powered by a 74 kW (99 hp) Shvetsov M-11 air-cooled five cylinder radial engine, first flew on 24 June 1927 piloted by M.M. Gromov. After some modifications the next flight took place on 7 January 1928. Aircraft from the pre-production series were tested at the end of 1928 and serial production started in 1929 in Factory Nr 23 in Leningrad. Production in the Soviet Union ended in 1953, but license-built CSS-13 were still produced in Poland until 1959. Picture - A damaged and abandoned Po-2 forced to land in Ukraine, and subsequently captured by German troops, 1941. From the beginning, the U-2 became the basic Soviet civil and military trainer aircraft, mass produced in a "Red Flyer" factory near Moscow. It was also used for transport, and as a military liaison aircraft, due to its STOL capabilities. Also from the beginning it was produced in an agricultural aircraft variant, what earned it its nickname Kukuruznik. Although entirely outclassed by contemporary aircraft, the Kukuruznik served extensively on the Eastern Front in World War II, primarily as a liaison, medevac and general supply aircraft. It was especially useful for supplying Soviet partisans behind the front line. Its low cost and easy maintenance led to a production run of over 40,000. Manufacturing of the Po-2 in the USSR ceased in 1949, but until 1959 a number were assembled in Aeroflot repair workshops. First trials of arming the machine with bombs took place in 1941. During the defence of Odessa, in September 1941, the U-2 was used as a reconnaissance aircraft and as a light , short-range, bomber. The bombs, dropped from a civil aircraft piloted by Pyotr Bevz, were the first to fall on enemy artillery positions. From 1942 it was adapted as a light night ground attack plane. Nikolay Polikarpov supported the project , and under his leadership, the U-2VS (voyskovaya seriya - Military series) was created. This was a light night bomber, fitted with bomb carriers beneath the lower wing, to carry 50 or 100 kg (110 or 220 lbs) bombs up to a total wweight of 350 kg (771 lb) and armed with ShKAS or DA machine guns in the observer's cockpit. Wehrmacht troops nicknamed it Nx�hmaschine (sewing machine) for its rattling sound and Finnish troops called it Hermosaha (Nerve saw). The enemy soon became aware of the threat posed by the U-2, and Luftwaffe pilots were given special instructions for engaging these aircraft, which they disparagingly nicknamed Rusfaner or "Russian Plywood". The material effects of these missions may be regarded as insignificant, but the psychological effect on German troops was much more noticeable. They typically attacked by complete surprise in the dead of night, denying German troops sleep and keeping them constantly on their guard, contributing yet further to the already exceptionally high stress of combat on the Eastern front. Their usual tactics involved flying only a few meters above the ground, rising for the final approach, cutting off the engine and making a gliding bombing run, leaving the targeted troops with only the eerie whistling of the wind in the wings' bracing-wires as an indication of the impending attack. Luftwaffe fighters found it extremely hard to shoot down the Kukuruznik because of three main factors: the rudimentary aircraft could take an enormous amount of damage and stay in the air, the pilots used the defensive tactic of flying at treetop level, and the stall speed of both the Messerschmitt Bf 109 and the Focke-Wulf Fw 190 was similar to the Soviet craft's maximum cruise speed, making it difficult for the newer aircraft to keep a Po-2 in weapons range for an adequate period of time. The U-2 was known as the aircraft used by the 588th Night Bomber Regiment, composed of an all-women pilot and ground crew complement. The unit became notorious for its daring low-altitude night raids on German rear-area positions, with veteran pilots Katya Ryabova and Nadya Popova on one occasion flying 18 such missions in a single night. The women pilots observed that the enemy suffered a further degree of demoralization simply due to their antagonists being female. As such, the pilots earned the nickname "Night Witches" (German Nachthexen, Russian Ночные Ведьмы/Nočnye Ved’my). The unit earned numerous Hero of the Soviet Union citations and dozens of Order of the Red Banner medals; most surviving pilots had flown nearly 1,000 combat missions at the end of the war and had taken part in the Battle of Berlin. North Korean forces used the Po-2 in a similar role in the Korean War. A significant number of Po-2s were fielded by the Korean People's Air Force, inflicting serious damage during night raids on Allied bases. UN forces named the Po-2's nighttime appearance Bedcheck Charlie and had great difficulty in shooting it down - even though night fighters had radar as standard equipment in the 1950s, the wood-and-fabric-construction of the Po-2 gave only a minimal radar echo, making it hard for an opposing fighter pilot to acquire his target. On 16 June 1953, a USMC AD-4 from VMC-1 piloted by Major George H. Linnemeier and CWO Vernon S. Kramer shot down a Soviet-built Polikarpov Po-2 biplane, the only documented Skyraider air victory of the war. U-2: Basic model, built in large numbers as a two-seat primary trainer. It was also built in many different versions, both as civil and military aircraft. The U-2 variants also included a light transport, utility, reconnaissance and training aircraft. Power plant was the M-11 radial piston engine of 75 kW (100 hp). Later models were also equipped with uprated M-11 engines of 111 kW (150 hp). Some aircraft were fitted with a rear closed cabin, other were fitted with sledges or floats. U-2A: Two-seat agricultural crop dusting aircraft, powered by a 86 kW (115 hp) M-11K radial piston engine. Later redesignated Po-2A after 1944. U-2AP: Agricultural aircraft, with a rear cab replaced with a container for 200-250 kg (441-551 lb) of chemicals. 1,235 were built in 1930-1940. U-2G: This experimental aircraft had all the controls linked to the control column. One aircraft only. U-2KL: Two aircraft fitted with a bulged canopy over the rear cabin. U-2LSh: Two-seat ground-attack, close-support aircraft. The aircraft were armed with one 7.62 mm (0.30 in) ShKAS machine-gun in the rear cockpit. It could also carry up to 120 kg (265 lb) of bombs and four RS-82 rockets. Also known as the U-2VOM-1. U-2LPL: Experimental prone-pilot research aircraft. U-2M: This floatplane version was fitted with a large central float and two small stabilizing floats. Not built in large numbers. Also known as the MU-2. U-2P: Floatplane version, built only in limited numbers, in several variants with different designations. U-2S: Air ambulance version, built from 1934. It could take a physician and an injured on a stretcher on a rear fuselage, under a cover. Variant U-2S-1 from 1939 had a raised fuselage top upon the stretcher. From 1941 there were also used two containers for stretchers, that could be fitted over lower wings or two containers for two seating injured each, fitted under lower wings. U-2ShS: Staff liaison version, built from 1943. It had a wider fuselage and a closed 4-place rear cab. U-2SP: Civil transport version, could carry two passengers in open individual cabs, built from 1933. Other roles included aerial survey, and aerial photography. 861 were built between 1934 and 1939. U-2SPL: This limousine version was fitted with rear cabin for two passengers. U-2UT: Two-seat training aircraft, powered by a 86 kW (115 hp) M-11D radial piston engine. Built in limited numbers. U-2LNB: Soviet Air Force night attack version, built from 1942. Armed with one 7.62 mm (0.30 in) ShKAS, plus up to 250 kg of bombs under the wings for land support. Earlier aircraft were converted to improvised bombers from 1941. 'U-2VS : Two-seat training and utility aircraft. Later redesignated Po-2VS after 1944. U-2NAK: Two-seat night artillery observation, reconnaissance aircraft. Built from 1943. U-3: Improved flying training model, fitted a 149 kW (200 hp) M-48 engine. U-4: Cleaned-up version with slimmer fuselage. Not built in large numbers. Po-2GN: "Voice from the sky" propaganda aircraft, fitted with a loud speaker. Po-2L : Limousine version with an enclosed passenger cabin. Po-2P : Post-war floatplane version. Built in small numbers. Po-2S: Post-war air ambulance variant, with a closed rear cab. Po-2S-1: Post-war ambulance version, similar to the pre-war U-2S. Po-2S-2: Post-war ambulance version, powered by a M-11D radial piston engine. Po-2S-3: Post-war ambulance version, which had two underwing containers, each one was designed to transport one stretcher patient. 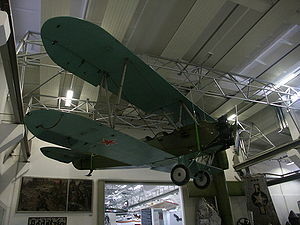 Also known as the Po-2SKF. Po-2ShS: Staff communications aircraft, fitted with an enclosed cabin for the pilot and two or three passengers. Po-2SP: Post-war aerial photography, geographic survey aircraft. RV-23: This floatplane version of the U-2 was built in 1937. It was used in a number of seaplane altitude record attempts. The RV-23 was powered by a 529 kW (710 hp) Wright R-1820-F3 Cyclone radial piston engine. CSS-13: Polish licence version, built in Poland in WSK-Okęcie and WSK-Mielec after World War II (about 500 built in 1948-1956). CSS S-13: Polish ambulance version with a closed rear cab and cockpit and Townend ring (53 built in WSK-Okęcie in 1954-1955, 38 converted to S-13). E-23: Research version, built in the Soviet Union in 1934, for research into inverted flight. Albanian Air Force received four aircraft in 1951 and operated them until 1964. Finnish Air Force operated four captured aircraft. Free French Air Force operated Po-2s in the Normandie-Niemen unit. The Hungarian Sport Bureau operated some aircraft before the 1956 Hungarian Revolution; Three confirmed were in Dunakeszi, one confirmed in Kisapostag. Turkish Air League (Turk Hava Kurumu) received two U-2s which were given to Turkey as a gift from Russia in 1933 on the occasion of the 10 years anniversary of the Turkish Republic. The Po-2 is featured, as the U-2, in the Harry Turtledove alternate history series Worldwar, as one of the few examples of human machinery that has managed to evade destruction from a technologically superior invading alien force. Because of the Po-2's wooden construction, low altitude, and slow speed, the aliens have an extremely hard time detecting it or shooting it down. Bargatinov, Valery. Wings of Russia (Russian). Moscow: Eksmo, 2005. ISBN 5-699-13732-7. Dorr, Robert F. B-29 Superfortress units of the Korean War. Botley, Oxford, UK: Osprey Publishing, 2003. ISBN 1-84176654-2. Gordon, Yefim. "Soviet Air Power in World War 2". Hersham-Surrey, Midland Publishing, 2008. ISBN 978-1-85780-304-4. Keskinen, Kalevi et al. Suomen ilmavoimien historia 13 − Syx�ksypommittajat. (in Finnish) Forssa, Finland: Tietoteos, 1989. ISBN 951-9035-42-7. Myles, Bruce. Night Witches: The Amazing Story Of Russia's Women Pilots in World War II. Chicago, Illinois: Academy Chicago Publishers, 1997. ISBN 0-89733-288-1. Szewczyk, Witold. Samolot wielozadaniowy Po-2 (TBiU #74)(Polish). Warszawa, Poland: Wydawnictwo MON, 1981. ISBN 83-11-06668-X. Velek, Martin. Polikarpov U-2/Po-2 (bi-lingual Czech/English). Prague, Czech Republic: MBI, 2002. ISBN 80-8624-02-7.